We spent over 30 hours researching and testing 20 different digital photo frames and found that resolution, extra features, and photo capacity were most important. The Pix-Star digital photo frame scored high marks in all categories and is our top pick. The easy to use interface allows users to navigate the menu easily while organizing their photos in a variety of ways. It comes with a convenient remote control that allows the user to complete any tasks easily without having to touch the frame’s screen. This digital frame will run automatically and play slideshows, and can even forecast weather. Technology has advanced so much over the last several decades that there are more lifestyle options available than ever before. Digital photo frames are a unique and engaging way to show off those cherished family photos in a way that is fun, effortless and that allows one frame to house hundreds of photos. It is a great way to show off more family photos without having to worry about space for hundreds of picture frames. There are commercial uses for digital photo frames as well, including in sales offices to display products, in studios to showcase an artist’s work in a unique way and much more. There are many different types of digital photo frames and they can range in size, style, features and more. They make fantastic gifts too and can be a really unique gift for a newly married couple with photos from their wedding and reception. 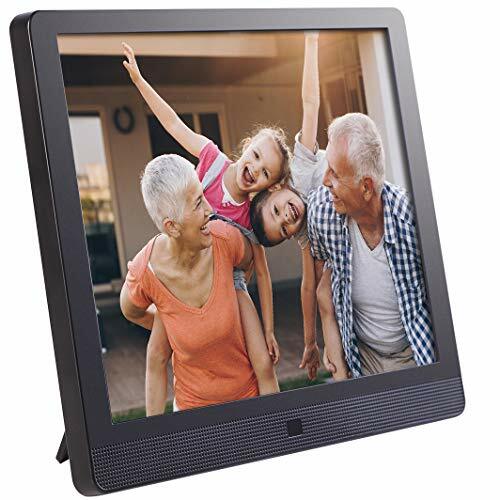 You can enjoy looking at your photo memories in full screen, no fingerprints and with full resolution with the Pix-Star 15” Wi-Fi Cloud Digital Photo Frame. The small remote control and buttons allow users to complete all the tasks they could want without having to touch the screen. Just a few buttons control the whole photo frame, making it simple and easy to use. The intuitive interface allows simple navigation even if you have thousands of pictures to go through. Organization is easy and allows users to display external web albums only, local albums only or play all where all the different albums are played. When the photos get added to the digital photo frame, they are auto-resized into 1024 x 768 making them the perfect size to be rotated inside the frame. Your photos will be displayed in 4:3 ratio and will rotate to the proper orientation automatically so there is nothing for you to do. Once everything is set up and configured, the photo frame runs on auto-pilot and will forecast weather, play slideshows, auto-rotate new photos that are uploaded and more. This is the perfect gift for grandparents and parents to enjoy pictures of the kids and grandkids in a unique and eye-catching way. One interesting feature is that the digital photo frame will check for photo-mails automatically and alert you when a new one has been detected and added. One of the easiest ways to organize and get in touch with your photographs is with Nixplay Original 15” Wi-Fi Cloud Digital Photo Frame. You can send email or photos right to the frame itself with minimal trouble. There is also a Nixplay mobile app as well. Users can upload photos from the computer or tablet, and access social media platforms as well including Facebook, Dropbox, Instagram, Picasa, and Flickr. You can even create playlists with your favorite photo moments and display them in any. The Nixplay account is safe and secure. You’ll have 10GB of FREE cloud storage to use and you can connect up to 5 photo frames. 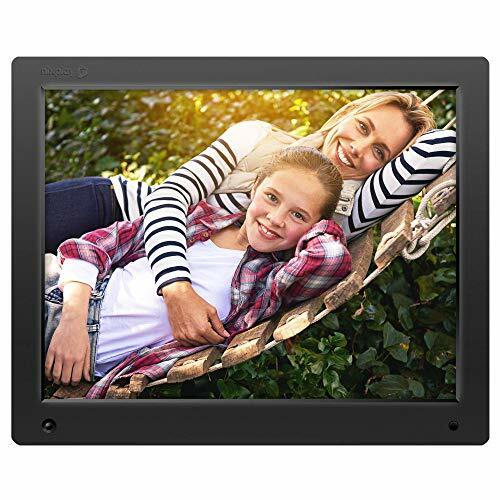 The Nixplay digital photo frame has settings that are customized to your preferences. They include: Shuttle photos, display most recent, photo transitions, captions and clock too. Your Nixplay digital photo frame turns on automatically that will display the most recent photos and then will shut off when no one is in the room. The anti-glare, LED backlit display showcases your photos perfectly. The rubberized surface finish feels great in your hands. The HD video play allows you to watch high definition from your audio devices using the USB or SC/SDHC card. Display your favorite photos with Micca’s 15” High Resolution Digital Photo Frame. Equipped with over 3 times the detail in the screen over standard digital frames, the photos will have exceptional image quality that will enhance every photo you add to the frame. Users need no set up and there’s no software to install either. All you have to do is load the storage that is included in this purchase with the photos you want to display and then insert it into the photo frame. The built in On/Off timer will automatically shut off or turn on the frame according to settings and schedule. Less than 1.5” thick, the mirrored acrylic digital photo frame is energy efficient and uses about the same power as an energy saving- CFL uses, around 14 watts of power. Not only does this frame hold all your pictures, it can also play music and video through the headphone jack pr the built-in stereo speakers. All of these functions can be controlled with the compact remote that comes with the frame. There are literally hundreds of digital photo frames to choose from. Most technology companies have some version of a digital photo frame in their product line up. All of these choices might leave you feeling really confused. To choose the right digital photo frame, all you need to do is take a look at the three reviews we have done here on three of the top rated frames on the market. We have done extensive research on the top digital photo frames on the market. By comparing the top 20 frames against each other in the categories of resolution, size, clarity of picture, extra features, ease of use and a few more, we discovered these three digital frames that are at the top of the pack in those different categories. Continue reading the buyer’s guide below to learn even more about digital photo frames and how to choose the right one for your needs from all of the models available. The right information helps you to narrow the field and make an informed decision that you will be completely happy with. A digital photo frame is a special picture frame that displays your digital photos without having to use a computer. It resembles a tablet in looks but the purpose of a digital frame is much more specific. Most people use them to sit on a table or shelf to display their treasured photographs. Some of the newer models of digital photo frames play music and videos too. There are several things you want to look for when you are searching for the right digital photo frame for your needs. Some of the frames available are basic and have simple capabilities. Others are very extensive and have a lot of bells and whistles. 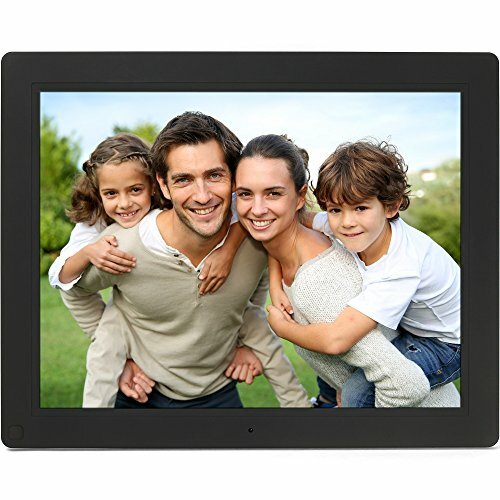 We have listed the features and specific functionalities of a good quality digital photo frame. These are the kind of things you want to look for when you start looking at different models. Auto crop and auto image enhancement so your photos look their best every time. Plays music that can go along with the slideshow of your cherished photos and that can play videos too so you can have some home videos in there as well. Offers different choices for sorting your photos and grouping them into the right categories that you want. Choice of frame style that includes the shape, color, size and detail that the digital photo frame contains. Speed controls that control how fast the frame transitions from one image to the next. Portrait or landscape display are the two basic types of frames available. The best onne to get is the frame that has a setting where the picture will automatically adjust to which it is: either portrait or landscape. This way you don’t have to eliminate any photos because they are one type of photo rather than the other. Having Bluetooth functionality is very convenient when it comes to transferring photos from your phone or computer to the frame. A slideshow is a great way to cycle through all of the photos you want to display to your guests and family. Most of the digital photo frames have this slideshow feature. Some can even play the slideshow with a music track playing. If you have a digital photo frame that has a sim card, you will also be able to send photos to the frame through regular email, MMS or internet upload. Video playback is a feature that is available on the digital photo frames that have video and music playing as part of their feature list. These frames also have built-in speakers as well. Some of the super, high end digital photo frames offer a feature that allows pictures to be printed right from the frame itself. Wi-Fi is a feature that new digital photo frames are starting to have. You can send files to different computers or cell phones and can download them from the internet as well, although mostly just from sites like Flicr. File type compatibility is important because if it is not compatible you won’t be able to upload photos. Popular formats are: jpg, bmp, png,mp3, wmv, mpeg, mkv, avi and others. Power Sources are a mean of powering the device. Do you want battery powered or electrical that needs to plugged into an outlet? Both have their advantages but this is a factor that can be chosen based on what you prefer since it doesn’t affect any other aspect of the digital photo frame. Controls and the ease of the user interface are very important. If you purchase a digital photo frame that is difficult to use, you will more than likely just end up not using it. Most of the digital frames have remote controls that come with them. These remotes make it very easy to change the brightness, timings, and other functions. Having a USB port is important for making the transfer of files much easier. Not all digital photo frames have USB ports, so if this feature is important to you make sure to check that it does have one. Not all digital frames are compatible with Windows and/or Mac. Make sure that you choose the frame that is compatible with the computer OS that you have. There are several things that can cause your digital photo frame to wear out and break down sooner than it would normally. Dust, heat, direct sunlight and more can affect the performance and picture quality of the frame. If LCDs are left in direct sunlight for too long they can end up fading and the picture will not be as vivid and bright anymore. We have some tips and information on how to take care of your digital photo frame so it will last as long as possible. Use canned air to blow the dust out of the memory card slots and other openings. Do not submerge the digital frame in water for any reason. Digital photo frames are a relatively new product and it’s gaining in popularity. There are many different features that a good quality digital frame can have including the ability to play videos, so buyers can use it as a mini home video collection as well. With so many choices available, searching through all of them can be overwhelming without the right information. The purpose of the reviews of the top digital photo frame choices and the informative buyer’s guide, you will be able to narrow down your search and find the perfect digital frame for your photos and videos. You can feel confident in your choice and will have something to enjoy for years.